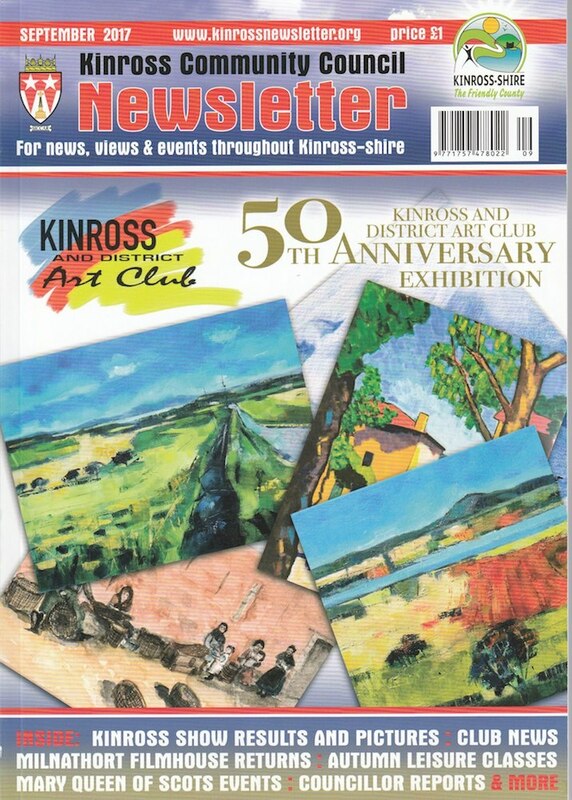 Venue No.56 on the Turquoise Route of Perthshire Open Studios 2017 is home to Kinross & District Art Club (KADAC), who this year are celebrating 50 years of promoting the visual arts in the area, with a celebration exhibition running until Sat 9 September. Started in 1967, following a very successful art exhibition of more than 200 paintings, the Club has nurtured the talent of generations of young and old and now boasts a membership of 60, including Associate Members who can no longer participate fully in its activities, but who like to keep in touch. The Club shares this anniversary date with the local RSPB Nature Reserve and to mark this occasion, they have organised some joint and reciprocal activities. In June they joined forces with an exhibition of the work of KADAC artists at the Loch Leven Nature Reserve and also organised outdoor painting sessions. Members of the Club have also produced a book of paintings and a commemorative carved wooden bowl which will be presented to RSPB officials at the Club’s annual Exhibition from 6-9 September. It is intended that these items will ultimately be available for the public to view at the Kinross Museum in the Loch Leven Campus. Members of the Club have also produced a book of paintings and a commemorative carved wooden bowl which was presented to RSPB officials at the Club’s annual Exhibition which is running from 6-9 September. It is intended that these items will ultimately be available for the public to view at the Kinross Museum in the Loch Leven Campus. The Club meets in the Millbridge Hall on Tuesday and Friday afternoons, with each member pursuing their own interest and style, but with Professional Artist Tom Sutton-Smith on hand to give advice and support. Tom also organises regular demonstrations by visiting artists and these, alongside in-house workshops, help members keep up to date with new techniques and ways of working. The success of this local club has been secured not just by its consistent focus on developing artistic talent, but on the sense of community and mutual support and encouragement of its members. The weekly break for a cup of tea and a chat is as much a feature as the painting! New members are very welcome, and anyone interested can go along, with more information on the KADAC Website, and the KADAC Facebook page.